Self-proclaimed Sh!t Theatre turn trash into treasure. They’ve been killing fringe circuits over the last few years, and Dollywould is meant to be their ‘mainstream cross-over hit’. Or so they say. The show then takes aim at every kind of ‘mainstream’ taste level imaginable: country music, visual art, physical beauty, cabaret, and theatre. It’s an absolute shitshow and the most fun I’ve had in a theatre in ages. A dozen or so of us were led to the roof of the Royal Festival Hall where we were told to expect: ‘A multi-sensory encounter of shifting sound, colour and light, which reinvents the gig-going experience as a site-responsive close-up standing performance.’ Whatever that is. The roof space of the building has a boiler room, pipes and generators claustrophobic submarine feel and we were gently led through it by the actor, performer, musicians The Neutrinos and visual artist Sal Pitman. The guitarist checked his pulse, and then he checked mine, and then he gave me a nod of reassurance. What was going on? The live music alternated between industrial electronic noise jazz and hypnotic acoustic, haunting lullabies. The projections and colour-scape, provided at points by an old fashioned slide projector, combined with the music and submarine architecture, to create a dreamlike and otherworldly experience. There was no narrative to speak of, other than the mention of breaths – 800 of them. Is this the number of breaths we take in an hour, the length of the performance? Proceedings culminated with a projection of a cloudscape on the ceiling and the audience being led outside on to the roof of the building to be exposed to the air and the beautiful summer London skies. This is a beautiful moment. Is it theatre, though? Depends on your definition. Post-dramatic theatre probably, in that there were no discernible characters, nor was there an apparent plot. It favoured feeling and mood rather than action, and in this respect it was hugely successful. 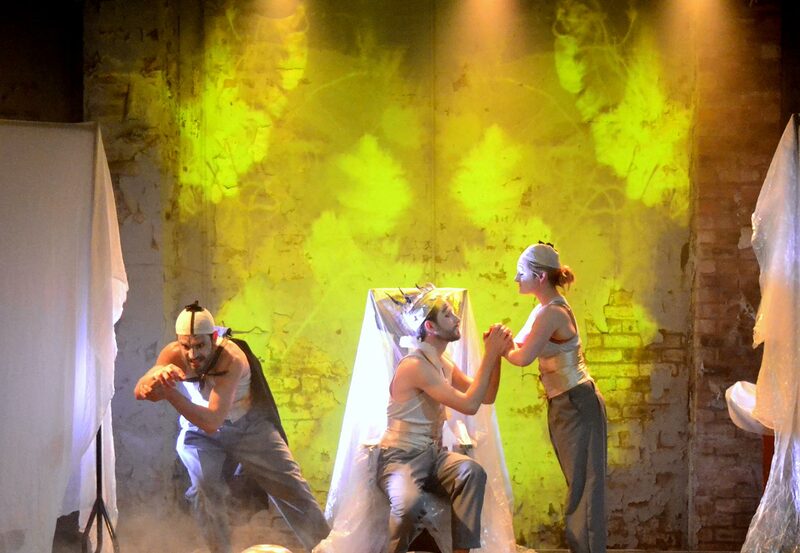 KlangHause: 800 Breaths runs through 23 July. Short and sweet, classic and comical. Thomas Monckton performs a solo piece glued to his spot, centre stage beneath a low hanging lamp, which obscures his body from the shoulders up for at least half of the work. Only Bones is a classic example of body manipulation that playfully explores all the possibilities that a clown can find and make with only his body, one square metre of space, and one light. These creative boundaries have been stretched and tested but remain in performance to give the show a formal identity and context for Monckton’s shenanigans. It’s so easy to ignore the homeless people that line the periphery of routine journeys and forget they are just as human as the rest of us, with passions, fears and often troubled pasts. The Marked puts homeless young man Jack at the centre of a desolate, urban landscape populated with pigeons, people who move him on and demons from his past. Masks and puppetry add a richness to his story, but not always warmth. In most of Jack’s encounters, be they real or in his head, he is believably under threat. Peter Morton’s puppets are sweet and whimsical, with Jack’s pigeon companion being particularly lovely and with an excellent range of movement. Jack as a child has a sadness to him, emphasised further by familial alcoholism that we can assume eventually drives him away from home. Grotesque masks by Grafted Cede Theatre are skilfully used to differentiate between fantasy and reality, with the haunted, oversized faces ever in the back of Jack’s eyes. Zahra Mansouri’s costumes make these figures larger than life and all the more threatening, rendering Jack helpless in their presence and the audience to empathise. 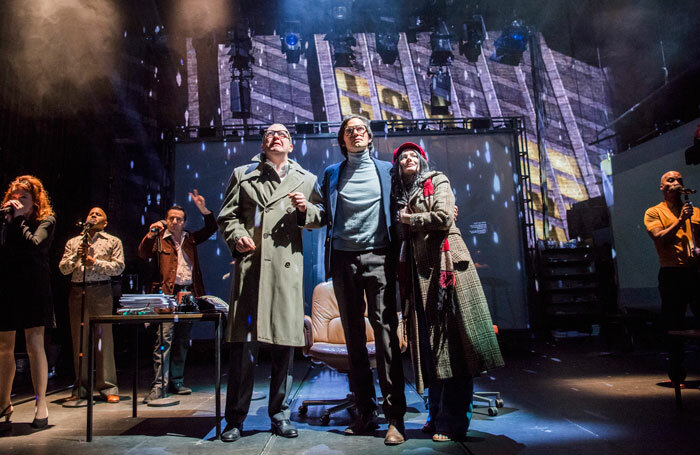 Devised by the cast of three and presumably with the support of director Allin Conant, the spoken text centres around Jack’s encounters with a homeless couple, Pete and Sophie. Here is where the show falls short: the potential for conflict and tenderness amongst the three isn’t fully realised due to too few, underwritten scenes. Though these human characters ground Jack in reality somewhat, there is also little focus on the dichotomy of reality vs. demons. There is real potential for a fight for Jack’s life or sanity between the two forces, but the script doesn’t capture as much of Jack’s struggle as it could. Visually, this is a wonderful production that makes some powerful points on the mental health of homeless people. Jack becomes a fully realised person through the creatures that haunt him, but his encounters with other humans don’t do him full justice. The Marked tours nationally through 2017. Elizabeth has two daughters. Her youngest is “fine”. Her eldest has profound hearing loss. This diagnosis, in our able-bodied world with all its bias and privilege for those that are “normal”, is a hard one to take. Elizabeth wrestles with guilt, frustration and the never before considered world of adaptation to suit her daughter’s needs. Theatre maker and actor Erin Siobhan Hutching grew up in a mixed D/deaf and hearing household. Collaborating with the Deaf & Hearing Ensemble, People of the Eye is her story, and those of families everywhere. It tells of parents, siblings, signing and secret languages. Projections and signing facilitates aid accessibility and support storytelling, creating a heartwarming montage of moments. The story is thin, but the message is clear: living in both the D/deaf and hearing world is a blessing. Emily Howlett performs with Hutching as Elizabeth’s eldest. She signs as well as speaks and takes on several roles: a doctor, a sign language teacher and one of the two central characters. She and Hutching have a lovely chemistry and are generally believable as young siblings. Hutching also switches between Elizabeth and her younger daughter; these transitions are not always clear. There is an added pedagogic element of Elizabeth taking a sign language class where the audience becomes the rest of the class. Though good fun, it is slightly forced – the story of this family is much more engaging than a lesson. People of the Eye could certainly do with fleshing out, and its initial premise and structure are robust enough to withstand further development. The performances are engaging and they provide a lovely insight into family life with a disabled family member. The visual structure is a model for other productions seeking to increase their accessibility and can easily be applied to shows where deafness is not specific to the script. It’s a fantastic start with great potential. People of the Eye runs through 27th August.